The «eggdeps» tool analyses dependencies between installed Python eggs. (Eggs are a distribution format for Python software.) 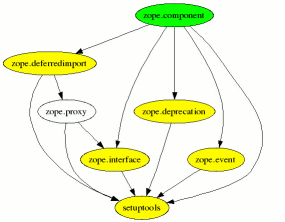 It computes a directed graph which describes direct as well as optional package dependencies. The program's output is either a text representation of the graph, a list of egg requirement specifications or an input file for the Graphviz tools which draw an image of the graph.